"He (President Trump) thinks he he himself is smarter than history and who cares about history history is bunk and I can beat history I know he cannot you I guess you know we cannot history shows he cannot but he thinks he can and that's the dangerous kind of people." The central bank is gonna do something, cut interest rates, buy assets, who knows what they will do and the market will have a rally. The market will rally because people will say "Ah, they've come in they're saving us again". But after that, that's when the real horrible part of the bear market is going to come. So, be worried! That's my view but I've made a lot of mistakes in my life. So, don't rely on me for your market timing, I'm the worst short-term trader in the world. But I expect gold to go under 1,000 dollars/ounce and if it does, I hope I'm smart enough to buy a lot more. If it doesn't, I've got plenty of gold already. Not many people in the world want to be socialist anymore because socialism has failed, communism has failed. Certainly nobody wants to be a communist and if they want to be a socialist, they want to be a rich socialist. There are people, it's often inexperienced younger people who don't know the history of socialism and how it has never worked - it's a good story communism, the problem is it's the story that doesn't work. No communist nation or a communist country has ever succeeded. They always fail but it's hard to explain that to somebody who's 23 years old and who's never seen much of the world. I own gold at the moment and I have for many years. I have not bought serious gold in a long time and I'm not buying it now. But if and when it goes down, I expect if it goes under one 1,000 USD per ounce, I hope I'm smart enough to buy a lot more gold. Everybody should have some gold in their portfolio as an insurance company of nothing else. Many of the stock markets in the world are not doing nearly as well as U.S. stocks because they don't have this gigantic fiscal boost that we have from Washington. It's not going to end well, you know, someday we're gonna have to pay the price for it. "Those who can not adjust to change will be swept aside by it. Those who recognize change and react accordingly will benefit." — Jim Rogers, Chairman of Rogers Holdings and Beeland Interests, Inc.
Nearly everybody in the market only knows interest rates going down. That's going to change because interest rates are going to go much, much higher not just in the United States but all over the world. This has never happened in recorded history, what we've seen. Interest rates in many countries became negative. This has never, ever happened before. I know we're all very worried when the market goes down 6 or 7 percent but even 6 or 7 percent is meaningless in the big scheme of things. Now, having said that it may be the end, the end may be finally here. It's been 10 years since we had a serious bear market in the United States. That's the longest in in recorded history so we may be ready. 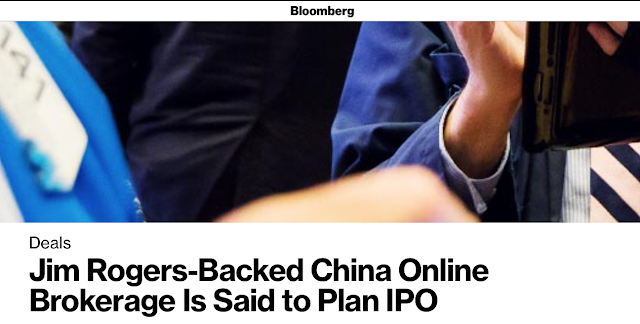 This may be the beginning of a big bear market. The way bear markets work is they start where nobody's looking. In 2007, Iceland went bankrupt and nobody cared. 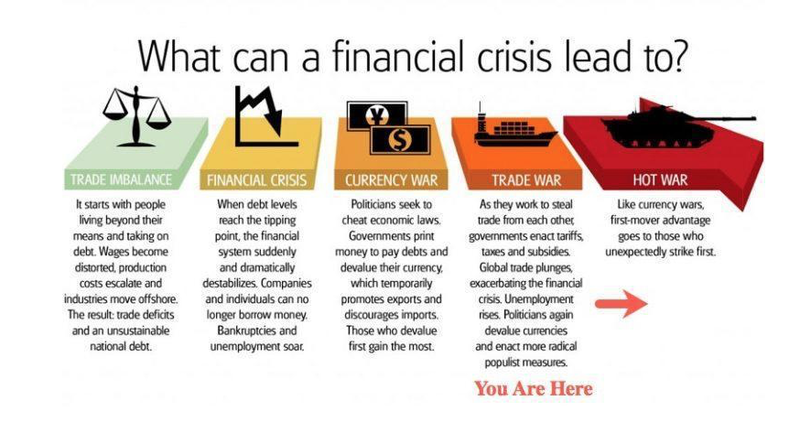 Ireland went bankrupt and then Northern Rock went bankrupt and Bear Stearns went bankrupt and by then some people started to see that something's going on. By the time Lehman Brothers went bankrupt everybody knew it was in the front page of the papers and the evening news and we all knew a year and a half or so later that there was a serious bear market in the works. That's the way things work. Now we have had things like that happening in the last year or so: Turkey, Venezuela, Argentina, Indonesia, Indian banks, Latvia... You know, the things that no he cares about or pays attention to and they're all very small but it may be the snowball gathering speed and this may be it. Is The Fed Going ‘Loco’? The truth is the Federal Reserve did go crazy a few years ago and drove interests rate down to zero which had never happened in history. Now, they are trying to get sanity back and raise them to the proper level. The Chinese market is down 60% from its all-time highs, the Japanese market is down 50% from its all-time highs. Russia is hated, Zimbabwe has just thrown out a absolutely absurd dictator who ruined the country for 40 years. There are great opportunities there. I've recently invested in a little bit not much in Ghana. Ghana was ruined but Ghana is changing dramatically. They have really smart, knowledgeable people running Ghana now. 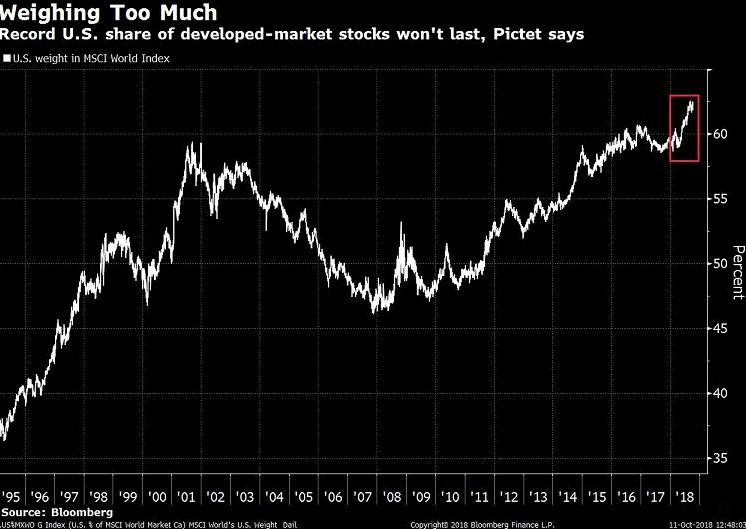 U.S. stocks are so dominant among developed markets that their position has become “unsustainable,” according to Luca Paolini, Pictet Asset Management Ltd.’s chief strategist. Paolini made the argument Wednesday in a Twitter post that showed the country’s weight within the MSCI World Index, representing 23 countries. The U.S. share rose to a record 62.5 percent last month and closed just below that peak Wednesday, according to data compiled by Bloomberg. “Overblown” earnings estimates are among reasons why the percentage is poised to fall, he wrote. Korea is going to be the most exciting country in the world for 10 or 20 years once North Korea is open and they unite. It's going to be very exciting for many reasons. You know as recently as 1970 North Korea was richer than South Korea. Communism ruins everything and so it ruined North Korea which means that North Korea is extremely cheap with lots of educated, disciplined and cheap labor plus lots of natural resources, standing right on the Chinese border. Combine that with lots of capital in the south, lots of know-how in the south. iIt's going to be very exciting. The Japanese are against it because Japan knows they cannot compete with an open Korea and they're doing. Jim Rogers views on the US Economy, the trade war with China and business in general. There's no such thing as winning a trade war. Do you see what's happening with NAFTA right now? Mr. Trump is shouting from the rooftops that he's won but you look at the results it means that the price of cars are gonna go up a lot for American citizens. I'm not sure how that's good for America. Maybe it's good for a few automobile workers but it's not good for most Americans. I mean I could go on and on and on. One of the reasons we have this huge balance of trade deficit is because the high cost of health care and litigation. It cuts our competitiveness a great deal. Staggering amounts of debt are being created even more than in the past and who would have thought it possible that we could build up even more debt than before but we are. And it's going into markets but as you probably know not all stocks are going up. In fact, a great number of stocks are going down and other countries in the world are not participating like we are in the US stock market. So, underneath there are more problems developing. October is just one week old and the carnage on Wall Street has already begun I wonder if the October complacency is starting to be shaken a bit with the down move that we see. The catalyst is rising interest rates which of course the markets have been ignoring. "Habits are the compound interest of self improvement." "Once the masses accept every pullback as simply another buying opportunity and ignore the risk in stocks, the end of a bull market is near. This was the case during virtually every strong bull market in history." I believe that if we see a real bear market in the US Dollar in 2019-2020, by the time the 2020 election comes around oil prices could have taken out the high price that they hit back in 2008 which was around 140-150 dollars a barrel. If you look at some of the sectors that continue to get beat up making new 52 week lows so even though the headlines are probably gonna be about the Dow Jones Industrials Average (DJIA) making another all-time record high, beneath the surface are a lot of stocks that are having a lot of problems. If you landed at JFK airport, you landed at a third world Airport and you enter into a third world taxi on a third world highway into a third world 5-star Hotel. You go to Singapore and you're out of the airport in 12 minutes. I didn't say out of the plane, you're out of the airport. Same thing now in the new Hong Kong Airport. For whatever reason they're efficient they're modern they work. I own a lot of US dollars right now, a lot of US dollars! Because what happens when the there's a crisis or turmoil people look for a safe haven. Yes, they think the US dollar is the safe haven so the US dollar is going to get overpriced it could even turn into a bubble depending on how bad the turmoil is at which point I'll sell my US Dollars and put it into something else. The gold standard has never worked it's worked for short periods of time but what happens is and you go back into history you see that the goals that God what reason it never works is because it's a great discipline you have to do you have to run a sound economy and politicians don't like sound discipline so what happens is they always change it. They actually think they're doing the right thing. In their off moments when they are not being recorded they will admit "Oh gosh, it's an experiment, we have no idea if this is good" but the reason is because they messed up so many places so many times they don't know what they're doing and in the end they're gonna ruin us all. They this is more or less their last experiment, their last gasp, because when this ends it's gonna be very very bad.